Extends the usability of Logic's popular Space Designer impulse reverb. Is there a better alternative to Space Designer Manager for Logic Pro? Is Space Designer Manager for Logic Pro really the best app in Audio category? Will Space Designer Manager for Logic Pro work good on macOS 10.13.4? Space Designer Manager for Logic Pro needs a review. Be the first to review this app and get the discussion started! Space Designer Manager for Logic Pro needs a rating. Be the first to rate this app and get the discussion started! Space Designer Manager for Logic Pro extends the usability of Logic's popular Space Designer impulse reverb and is it's perfect companion. The ever and ever growing number of 3rd party and user impulse responses shows Space Designer's drawback: Before you can use a impulse response file you must load it into a setting and save it. If you have hundreds or thousands of files this will be an exhausting and almost impossible task, because you have do it one by one. Space Designer Manager keeps you being creative because it does the job automatically for you in seconds. Furthermore it can find and relink impulse responses back to the setting files they belong to, if Logic can not find the files at the position that was saved in the setting. 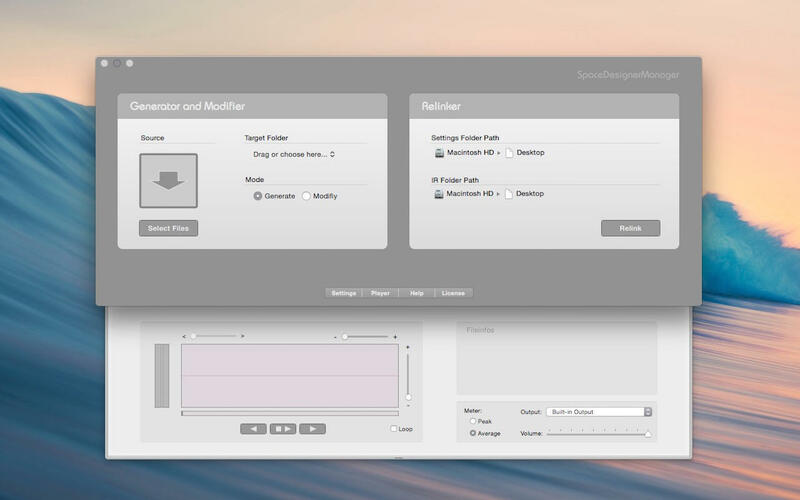 Space Designer Manager consists of two parts. On the left side you find the Generator which batch generates setting files for Space Designer compatible impulse responses. You can process single impulse response files, folders or multiple selections as you wish by drag and drop or the open file dialog. The program will process all files in folders and folders in folders with the format AIF, WAV, SD2 and SDIR in mono, stereo, truestereo, quadrophonic, B-Format and mono-omni surround. On the right side resides the Relinker which relinks setting files with the impulse responses they were originally pointing to by selecting a setting folder and the according impulse response folder. Relinker lets you choose the right file if there should be any files with the same name. 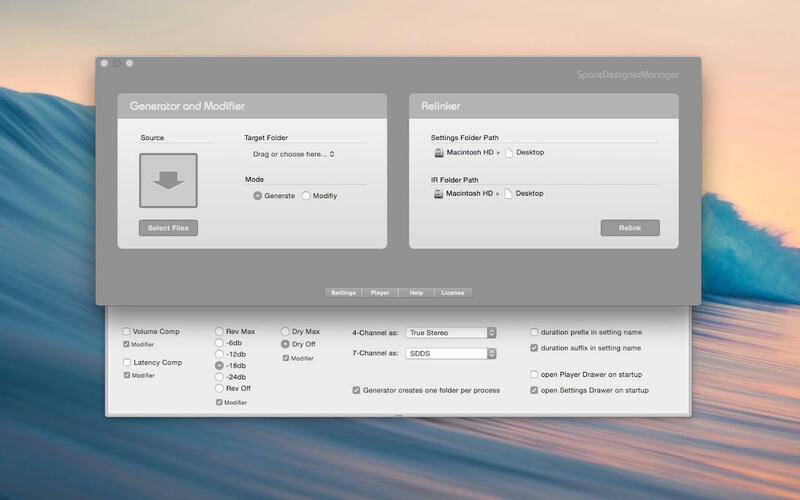 Space Designer Manager's Preferences Drawer lets you set various options for the pst setting file generation. You can decide if you want to use volume and latency compensation or not and also set the wet and dry level. For example, if you prefer the dry signal of your generated settings to be off, you can do so by simply setting the Dry Button to off.